A Bath night out is a must for anyone visiting our fair city who enjoys some after dark revelry. 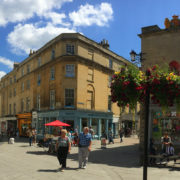 Despite its small size, Bath has plenty to offer those in pursuit of a late night’s partying, from swanky cocktails bars to dingy live music venues. A cosy pub can be the perfect solution to those cold wet winter days which make you want to roll over and stay in bed. Happily, there are dozens of welcoming winter pubs in Bath which will help brighten up an otherwise grey January day.